We raise and care for a variety of free range pure bred chickens that live like chickens are meant to live. They take dust baths, lay in the sun, scratch for bugs, and eat grass, clover, and other greens. We supplement their natural diet with a soy free, non GMO feed and treats like melons, yogurt, and veggies. In return they provide us with delicious and healthy eggs! Although some of our birds are dual purpose breeds, we are not currently raising chickens for meat. If you are looking for farm fresh chicken or turkey, please visit our friends at ​​ Our Father's Farm just minutes away from us here. 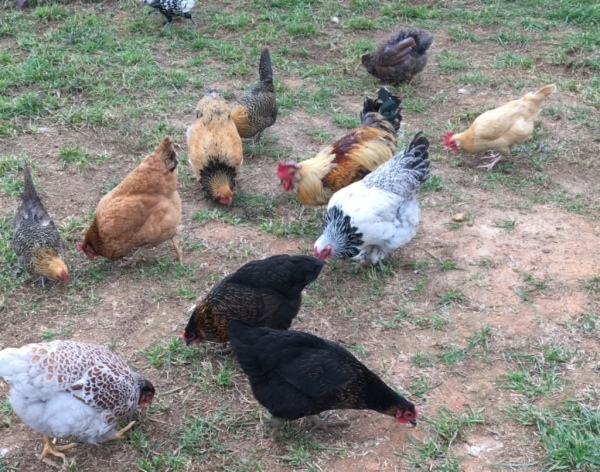 They can provide you with delicious pasture raised soy free, non GMO poultry!